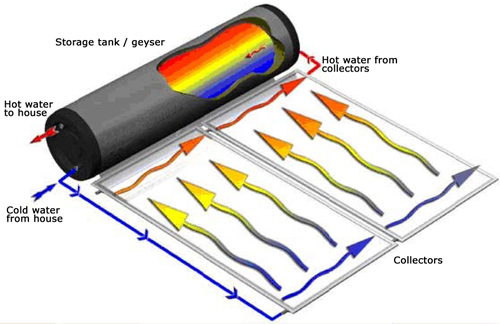 A direct solar geyser relies on warm water rising – a phenomenon known as natural convection – to circulate water through the flat plate collector and to the tank. The hot water storage tank is located above the flat plate or in the roof. As water in the plate heats, it becomes lighter and naturally rises into the tank above. Meanwhile, cooler water in the tank flows downwards into the absorber, thus causing circulation throughout the system. On very sunny days, a solar system can heat water to to boiling point. WHY SOLAR AND NOT GAS? Solar makes use of the sun to either heat water or generate electricity during daylight hours. Solar is also a technology and not a fuel, so there are no ongoing costs after installation as is the case with gas, which is also a limited resource. And because there are no moving parts, its virtually maintenance-free. Right now, solar delivers between an 18-30% return on investment each year based on electricity savings, far outstripping any other investment vehicle where you could place your money. Investing in solar to save on your electricity costs is a no-brainer, and the very best investment you can make right now for your business or home over the next 20-25 years. HOW CAN I SAVE ON MY WATER HEATING COSTS? The most power hungry device in the home is ageyser using an electrical resistance element. The most efficient energy saving technology for replacing electrical heating in a domestic home is a solar water heater. 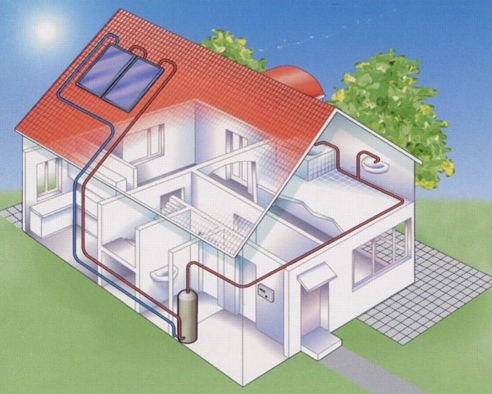 Heat pumps are an alternative to solar and electrical resistance elements. They mostly get used where solar is not efficient, possible or practical – for example in heavily shaded-areas, thatch roofs or very high hot water usage demands . Heat pumps are used extensively in a commercial environments where large volumes of water are being heated, for example hotels and B Bs, , can be extremely more attractive than solar saving up to 70% approx. ofof the energy consumed by a traditional through electrical geyser. resistance elements and can Heat pumps are also cheaper that solar in terms of the initial capital outlay, although they have a slightly longer payback time. be installed at a third of the cost less than solar. Both solar and heat pump technologies have vast energy efficiency and environmental benefits and are complementary technologies on saving energy. Your choice will depend on the capital you have available for the initial purchase, the projected savings and thus payback period you require, your motivation for updating your method of heating water, your usage as well as the site and technical aspects of the installation. Consulting with a reputable supplier like One Energy that is able to offer you a range of products across both heat pumps and solar systems will help you weigh up the alternatives and make the right choice. Low-flow shower heads reduce your hot water usage to around 10 litres per minute versus 15-30 litres per minute, indirectly saving you money by reducing the amount of hot water consumed, and saves water, one of our most precious resources. Many people believe renewable energy is too expensive without actually doing their homework. When we take them through the costs versus the savings, most are stunned at how absolutely affordable it is. The initial upfront cost is the only cost involved with solar and it can be financed. Many people put off making the switch to alternative energy sources because they don’t have the upfront cash. That’s why One Energy offers you competitive finance options. With every Eskom increase that comes each year, you’ll be saving more and more and protecting your pocket against the impact of hyperinflationary increases. So, instead of paying exorbitant electricity bills for absolutely no return, you’ll be investing your money into your new resources, saving thousands over the long term and increasing your property value by up to 15-20%. If looking at it from an investment point of view. If you invest R20-30 000 normally fixed for 5 years you, cannot get more than an 8% return annually and you have to pay tax on the return. But if you invest your money in buying a solar system you can expect an annual return of 30% or more from your savings and it is tax free. A high efficiency, properly sized solar system will typically provide up to a 50% saving on the energy required for hot water. It’s important to note that it gives a saving of 50% on your water heating bill, and not your entire electrical bill, unless the geyser is the only electrical device in your house. On average, water heating by traditional element accounts for 40-50% of your total bill. 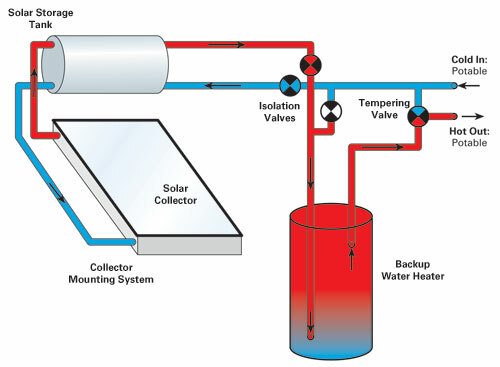 HOW DO I SIZE A SOLAR WATER HEATING SYSTEM FOR MY NEEDS? When going solar, the last thing you want to do is to under-size a system as this will lead to a situation where you don’t have enough water for your needs. Aa a rule of thumb, each person in the household uses around 100 litres of hot water a day. Check with your supplier about the size and the power output of the system. An under-sized or low efficiency system will result in insufficient hot water and a poor realisation on electricity savings, defeating the whole purpose of why you bought the system. HOW DO I KNOW I AM DEALING WITH A REPUTABLE SUPPLIER? With so many new products on the market with varying levels of quality, performance, technical expertise and installation experience, its often very difficult to know what the right system is for your needs and whether you are dealing with a reputable installer who will not only give you a thorough assessment of the right system, but also provide the after-sales service, support and product warranties that you need. This is one time you need to be very sure you are comparing apples with apples..
One Energy is a national franchise group of 30 branches which is growing rapidly based on the quality of our solutions, technical back-up, fully documented installations and methodologies, full maintenance plans and competitive finance options. Always question and verify that the system you choose is firstly fit-for-purpose, has been quality checked and vetted against our local standards and that the installer is suitably qualified and authorised. Choose a supplier that is able to offer you the full range of offerings on the market that is fit for your needs and lifestyle. There are many instances where a solar system may work better, and others where a heat pump is a better option. Make sure you don’t get pushed into a sale because that’s all your supplier has to offer you. Quality, efficiency and durability are important considerations. Our systems come with extended five year warranties, and with an annual service, many systems will deliver great results for over 20 years. Buying a cheap system on a deal that’s too good to be true, probably is. Buying down on quality is likely to be an expensive purchase at the end of the day – the efficiency of the system will be compromised and before long the system will not provide the heat or energy output required to make a significant enough impact on reducing your utility bill – the whole point of why you bought it in the first place. There are many cheap imports flooding the market, and everything about their performance and components is cheap too. Buyer beware! Another important aspect is the installation of the system. You can have a great system but if your installer does not know the finer aspects of the job and use the best quality installation materials, your overall system performance will be compromised and in turn reduce the savings and benefits of the system. After sales back-up and support is essential. There will be instances – although not often – that you may need your system checked or reconfigured for various reasons. If you cannot get an installer out to even visit you for a sales call, what are your chances of getting them there for a back-up call? Dealing with a reputable supplier with a good service ethic that you know is going to be around for years to come to honour warranties and service calls is important.